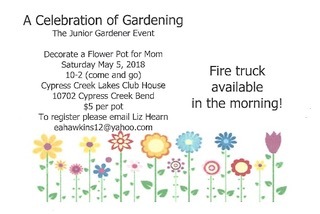 Every year the Cypress Creek Garden Club hosts a Mother's Day event called The Junior Gardener Event. For only $5 per pot your child can custom paint their own flower pot to give to Mom or Grandmom and show their appreciation on her special day. There are no limits on the number of pots to paint, however so the Garden Club can make sure they bring enough for everyone, registrations should be emailed to Liz Hearn at [email protected]. There will also be a Fire Truck on site in the morning and possibly a Police Car as well for the kids to check out!